You can buy Goatsbridge rainbow trout pate from all major supermarkets in Ireland and specialist shops, or in bulk from our online shop if you’re having a party. However, you might like to make a variation of your own, particularly if you don’t live in Ireland. Here’s a quick and simple recipe. Break up some Goatsbridge barbecue smoked trout into a bowl . Add the cream cheese and mayonnaise and a dash of lemon juice . Mix with a fork or a hand blender until smooth . 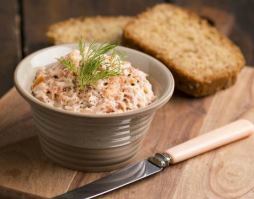 If you liked this easy smoked trout pate recipe you can buy Goatsbridge trout from our online shop here or in all good Irish supermarkets, including Supervalu and Dunnes Stores as well as specialist shops around the country .